I am in love, and she is British. 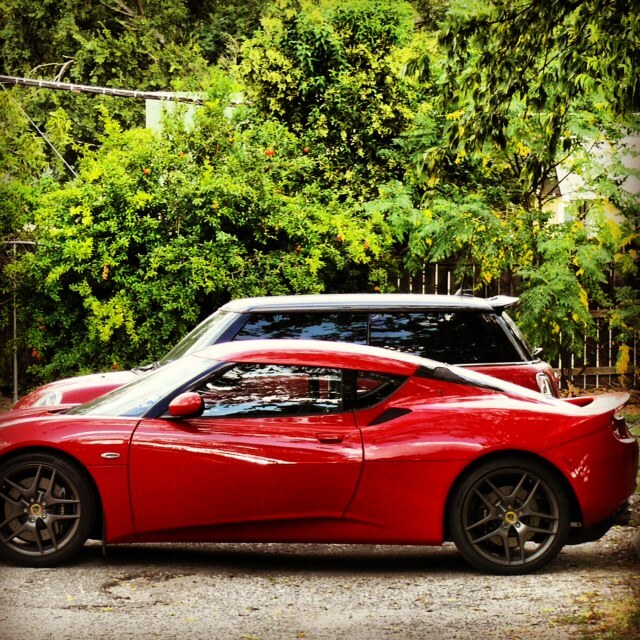 You may recall last month’s visitor to my driveway – a beautiful red Lotus Evora. (In case you forgot, I wrote about it here, here, here and here). Since bidding a fond farewell to the Evora, I have had time to reflect on the experience and the opportunity to be around other Lotuses (plural: Loti? 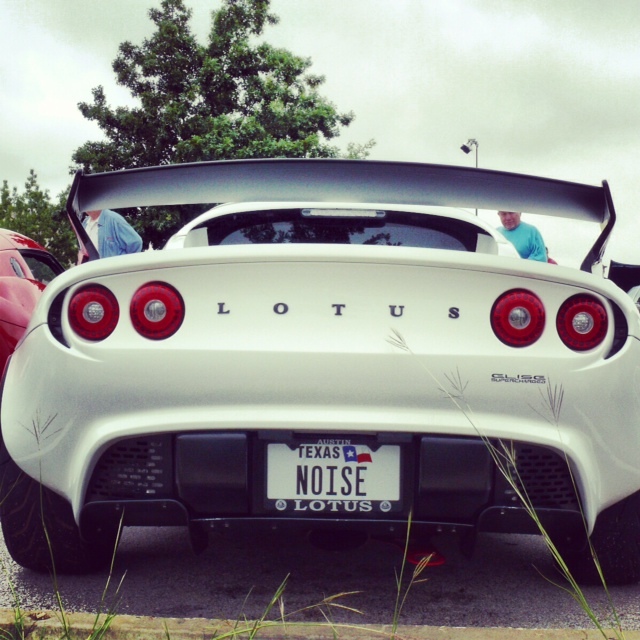 ), and have reached a conclusion: I love Lotus. 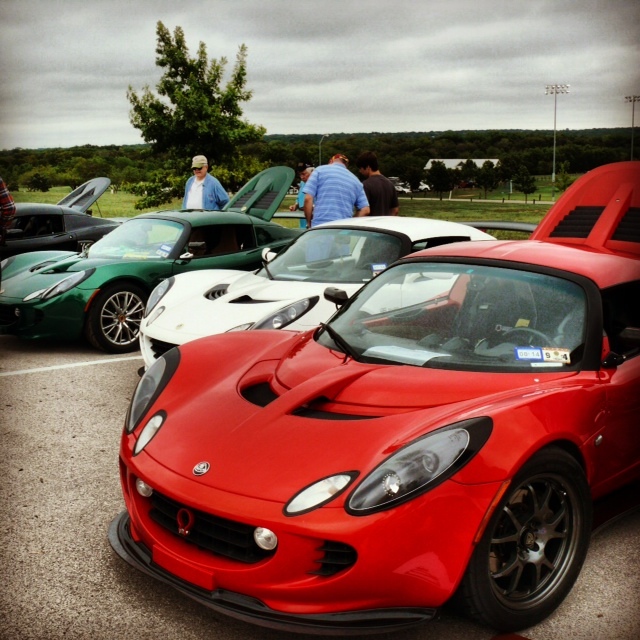 Lotus is a quirky little British car company, turning out lightweight, stripped-down, all-nonsense sports cars brought to you by the letter “E” (Elise, Exige, Europa, Espirt, Elan, Evora…). The initials in the company logo are those of the company founder, the legendary Colin Chapman (or, officially, Anthony Colin Bruce Chapman). 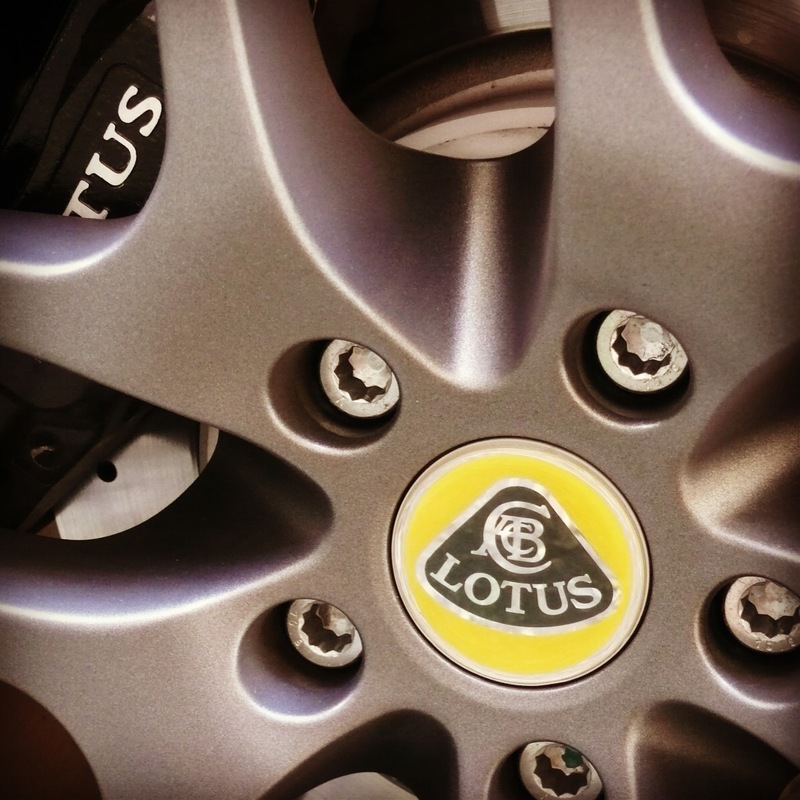 Lotus was founded in 1952 and, having weathered many storms and corporate changes over the years, still exists today, churning out Loti in Hethel, England. The Evora is the only model currently available on our shores. 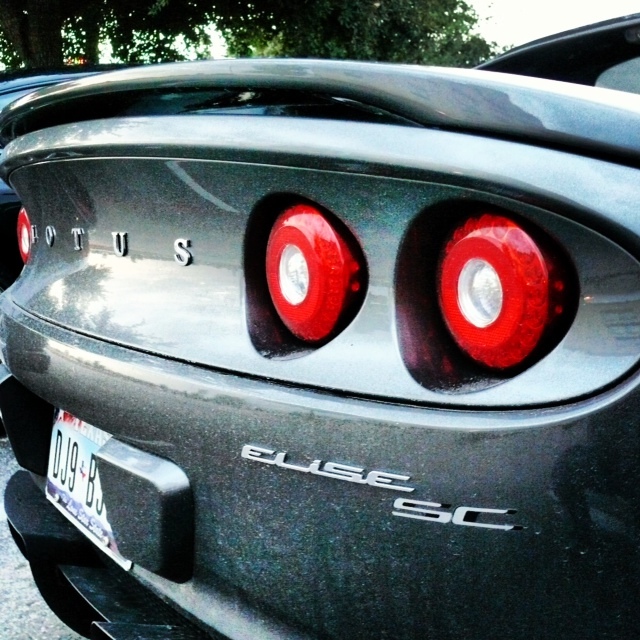 You may be able to find a pre-owned Elise, but the U.S. no longer gets new ones. 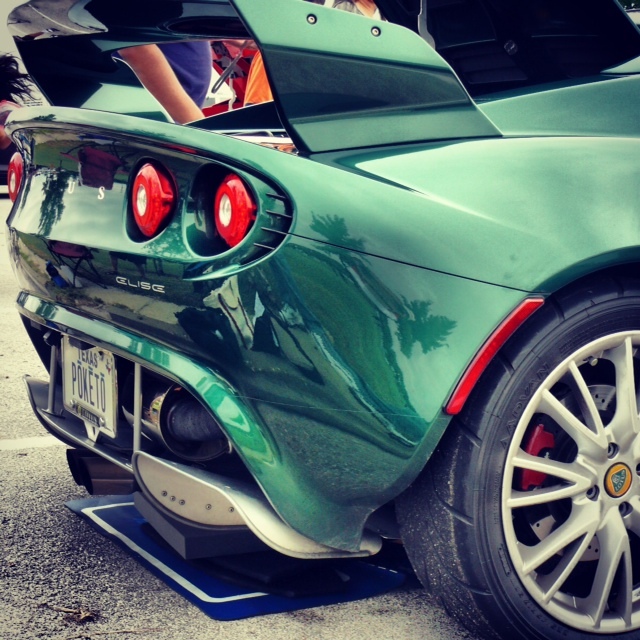 Those lucky Brits also get the Exige S – it’s too cool to be street-legal here. Here’s one of many reasons to love Lotus and its crazed fanatics: when the Evora was introduced, the Loti purists howled that it was a bloated, over-sized, soft sell-out compared to the Elise and the Exige. 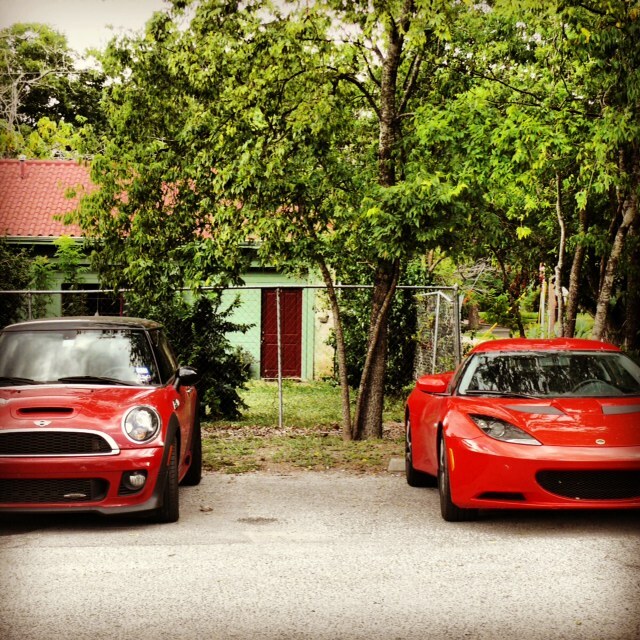 This is obviously true, as seen in this photo comparison of the Evora with the Red MINI. Ridiculously large, that Evora. Plus, it seats four (well, at least there are four seat belts). Horror! 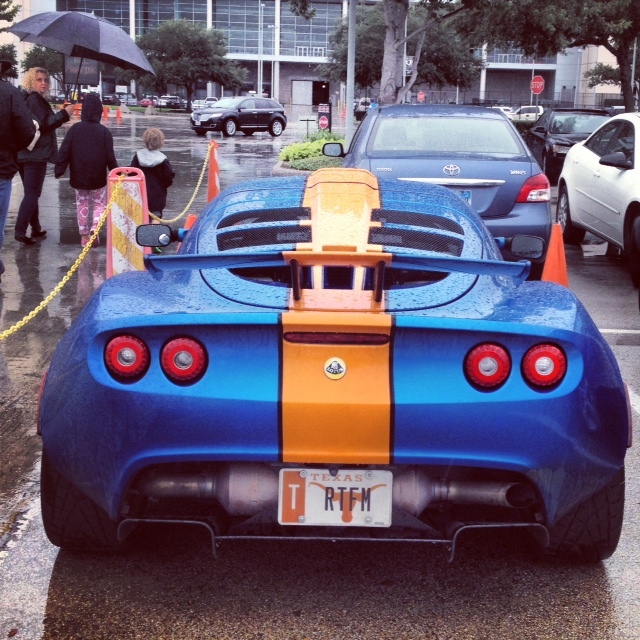 I do so love the self-righteous sports car purists. No, really, I do. They get a little ridiculous at times, but their hearts are in the right place. 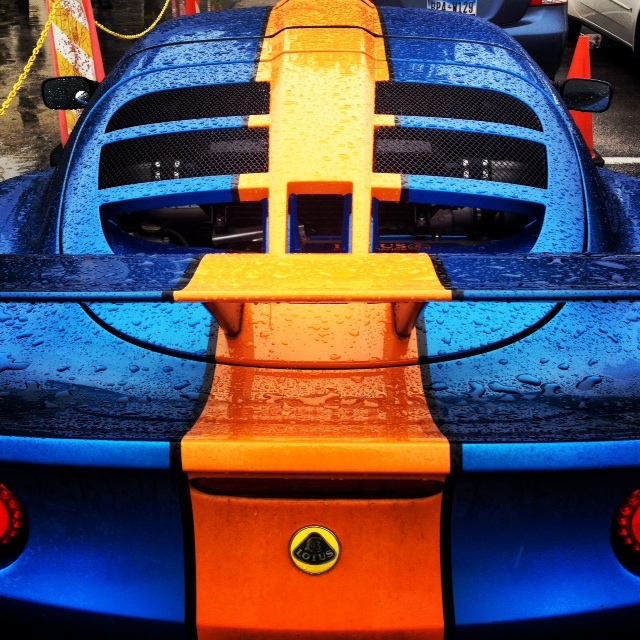 With this background in mind, I have always had a crush on Lotus, without ever having actually met one. 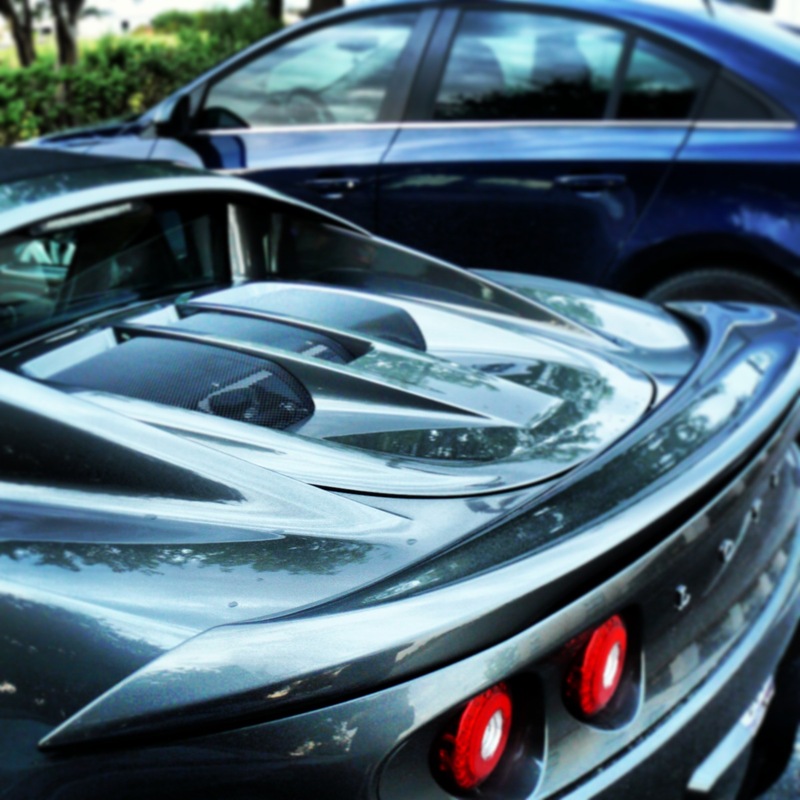 Suddenly, one day, I was face to face with an Evora, and falling in love for real. How did this happen? Meet Dan. Dan is a friend and aficionado of cool forms of transportation, from cars to motorcycles to airplanes. Dan also owns a company named Lotus. Lotus, located in Andrews, Texas, disposes of Naturally Occurring Radioactive Material, or NORM, and is on the cutting edge of oil and gas waste disposal. Dan, in the most brilliant display of logic of which I have ever heard, decided to buy a Lotus vehicle after seeing one in Hawaii, and because his company is named, you know, LOTUS. In an attempt to further this logic, I suggested to my employer, Cindy, that we change the name of our law firm to Aston and Martin. Jury’s still out on that one. The red Evora you have seen on this site belongs to Dan. She is a 2011 model that he bought new and has driven less than 4,000 miles. He told me that, when he drove her home to West Texas from the dealer here in Austin, it felt like the first time he had driven in 30 years. It’s that feeling, of really driving, of being nestled in between a flat-bottomed steering wheel and a gurgling engine (rear-mounted, so it’s right there, all nice and snuggly at your back), low to the ground and fleet of foot, that made me fall in love with the Lotus. 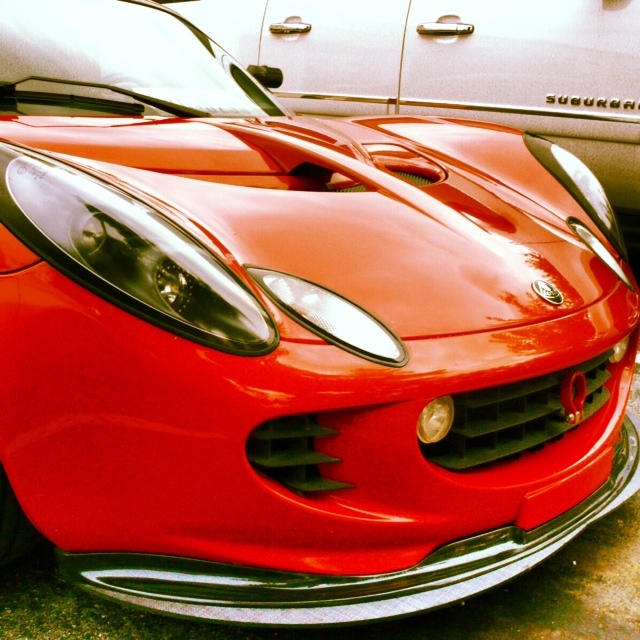 It is a pure, unadorned sports car. Seriously unadorned. If you want performance and luxury, get an Aston Martin (quite an excellent choice, by the way). If you want a tiny car that is hard to get into and out of, lacks cupholders and any reasonable storage space, and won’t massage your posterior, the Lotus is the car for you. 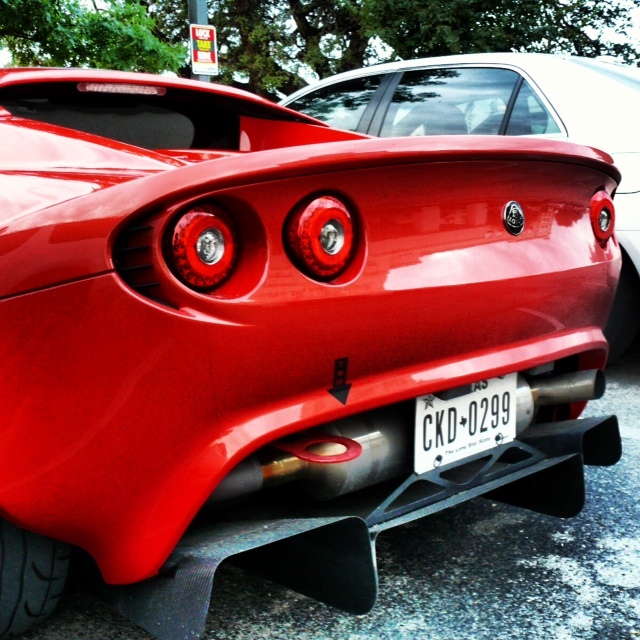 Honestly, the Lotus feels like a MINI that is more upscale and both more serious and more impish, all at the same time. And you can fit groceries for one in it. It’s right up my alley. 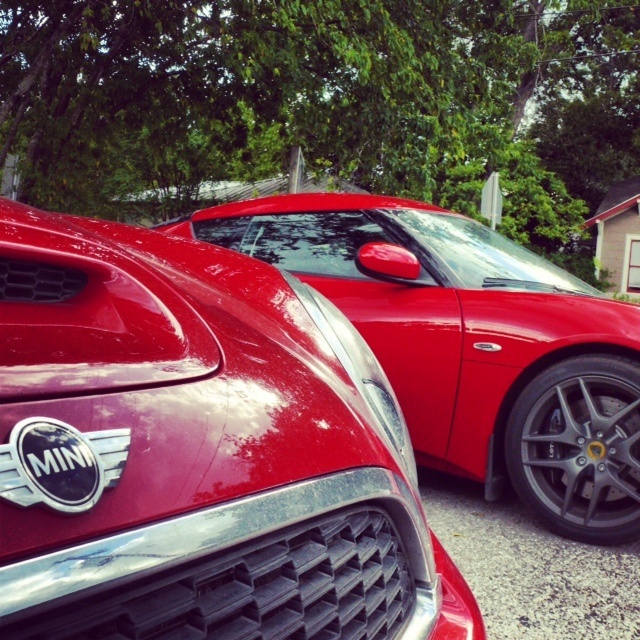 The Red MINI felt an immediate kinship. 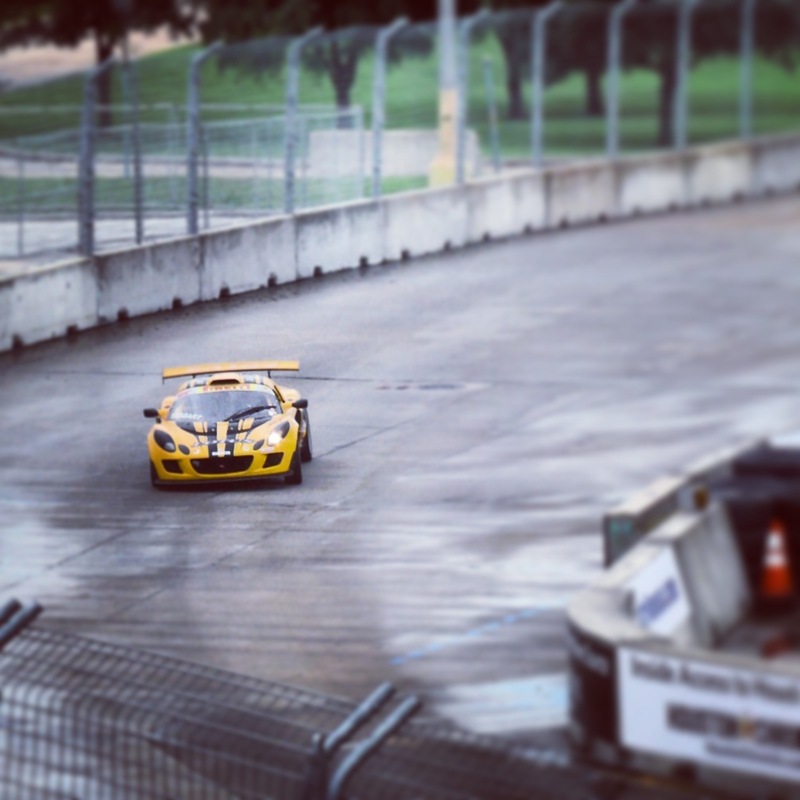 We were sad to see the Evora go, but felt so fortunate to have spent a little time with her. Thanks so much to Dan for his incredible generosity and for an introduction to such a cool brand. Since the Evora’s visit, I have been running into Loti left and right. Here are a few whose paths I’ve crossed lately. These are various iterations of the crazy-mad Elise. 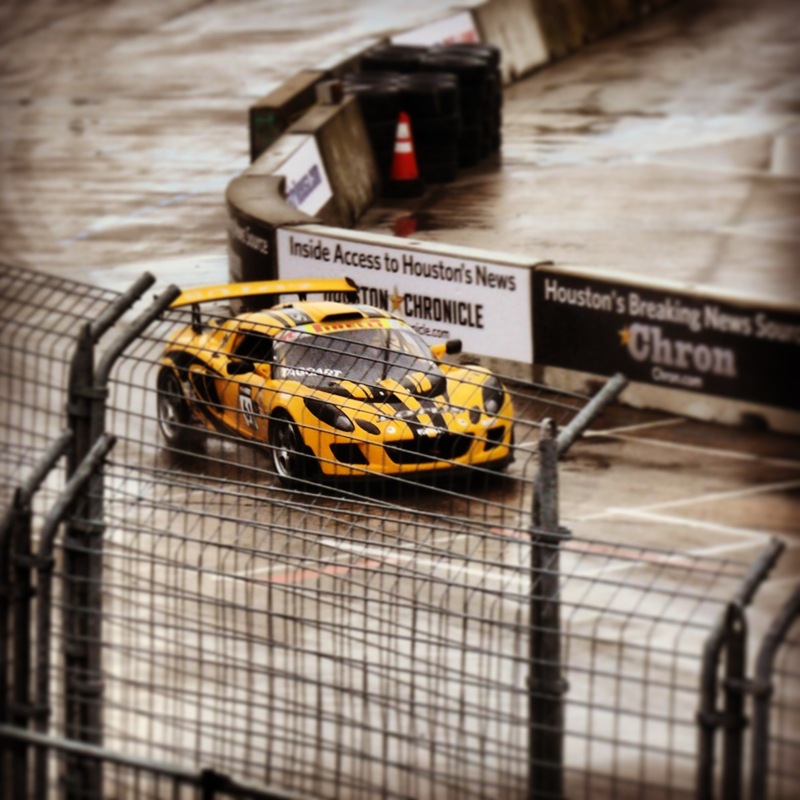 As if all of this weren’t enough to send my heart a-racin’, there is also such a thing as a racing Lotus. AND. Lotus has a Formula 1 team. Which happens to be one of my favorites. But that’s a story for another day. Ah, Lotus and MOTORista. We’ve had a brief courtship thus far, but one day we’ll be together forever. We were meant for each other. Anna, we met at TX ABCD . . . I have some pictures of a 1960 Lotus that might interest you. Send me your email and I will send them along.